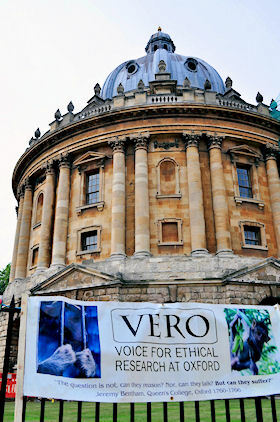 Welcome to the website and blog of Voice for Ethical Research at Oxford, a University-based group founded in 2006 to oppose the use of animals in medical research. If you would like to have more details about anything said or shown in these pages, please contact us at mail@vero.org.uk. 2006 was the twentieth anniversary of the Animals (Scientific Procedures) Act, which put into law the principle that researchers should only use animals where no other method of research would work. Those who devised the Act intended and expected that animals would therefore gradually disappear from the UK’s laboratories, as new and better techniques of research were developed. That has not happened. Although the numbers of animals used in UK laboratories did decrease for a while, they have been steadily going up again since the turn of the century, and are now about 50% higher than they were in 2000. For its part, Oxford University, a national centre for vivisection since the 1880s, directly championed the unwanted trend by starting to build, in 2004, a large new laboratory wholly devoted to animal experimentation. Such a project was quite contrary to the spirit of the law and to the public feeling which prompted the law, and VERO was originally set up as part of the wider protest against the building. 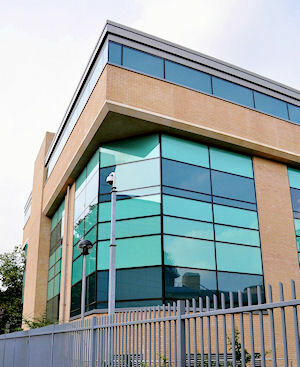 After a controversy which interrupted work on the building for over a year, the University’s new laboratory was finally opened for business in 2008. It holds about 16,000 animals, but the annual turnover of animals is well over ten times that number. In fact, more than 217,000 animals died in or after experiments in the building during the year 2016. They were mostly rodents, but included non-human primates, frogs, fish, rabbits, and others species. Of all the U.K. universities, Oxford is presently the largest user of laboratory animals. The public protest against Oxford’s new laboratory was largely the work of the grass-roots organisation SPEAK, originally formed to campaign (wholly successfully) against a similar development at Cambridge. SPEAK’s campaigning in Oxford continues today. VERO aimed to bring that protest inside the University, presenting the case against vivisection at seminars and other events, engaging with the University’s ethics committee and other relevant officials, keeping up the controversy in the University’s own journal and elsewhere, and promoting awareness through the University, and especially among the students, of the animal research being done there. This section provides a record of VERO events from 2006, with summaries of talks given by expert speakers on vivisection and allied subjects. There are also records of the University’s animal use and other commentary. Since 2015, this sort of topical material appears in the VERO blog. This section, sub-titled ‘What Oxford’s teachers and students have been saying during 250 years’, provides a brief annotated and illustrated anthology of quotations from Oxford people, starting with Dr Samuel Johnson in 1758 and ending with VERO’s patron Sir David Madden in 2008. Here are the various articles, letters, and other published material in which VERO has put the case against vivisection over the years, including pieces about research into Parkinson’s disease at Oxford, the visits to Oxford of politician Tony Benn and novelist J.M.Coetzee, weapons research, and the writings of C.S.Lewis. This section features some of the scientists who have spoken at VERO events, a selection of key publications on the science of vivisection and its flaws, and links to organisations which promote and fund bio-medical research without the use of animals. Some distinguished writers and activists against vivisection, who have supported VERO’s work. This section provides links to organisations which campaign in various different ways for animal-free medical research. Suggested practical actions for university students and others to take on behalf of animals in laboratories.